Welcome to another installment of LiveAnalysis! Today’s match is an all-Spanish final at Roland Garros: 7-time champion Rafael Nadal will meet his friend and compatriot David Ferrer, who will be making his debut in major finals. How did each men get here? Interestingly enough, it’s Nadal who’s played significantly more tennis than Ferrer. The Clay GOAT has dropped four sets of tennis on his way to this final (one to Brands, one to Klizan, and two to Novak Djokovic. And we all remember that Rafael found himself down a break in the fifth set against Novak on Friday, before winning 9-7-in-the-fifth win). David Ferrer, on the other hand, has yet to lose a set at Roland Garros. He’s taken advantage of a draw that broke perfectly for him: his slated quarterfinal opponent (Tomas Berdych, whom Ferrer handles easily anyway) lost in the first round. Dangerous floater Ernests Gulbis lost in his next match. The man who beat both Berdych and Gulbis, Gaël Monfils, also lost in his next match. Then, instead of Nicolás Almagro, who pushed Ferrer to the brink in Australia (but has never beaten him), Ferrer got to play a most exhausted Tommy Robredo in the quarterfinals. Robredo, as we know, had come back from 2 sets down in three consecutive matches (something that hadn’t happened since the Roman Empire was still standing, apparently). Regardless, Ferrer took full advantage of this oppportunity, and he has been simply ruthless in every single match. Jo-Wilfried Tsonga – who took out Roger Federer, David’s frequent tormentor – was his latest victim on Friday. The Frenchman was handed a thorough lesson in top-shelf clay tennis, and at age 31, David Ferrer finally made it to a Grand Slam final. A hard-earned prize for a man who’s all about hard work and persistence. Nadal and Ferrer have played each other in every Slam except Wimbledon. This will be the fifth meeting between the two in one of the four biggest events in tennis, and they’ve split their previous four encounters. Oddly enough, that split follows surface, too: Ferrer has won both hard court meetings (one at the US Open and one at the Australian Open), while Nadal has swept both matches at Roland Garros. Since David Ferrer beat Nadal twice in a row in 2007, he’s lost 15 out of the next 16 matches. .
17 out of the 23 matches (74%) between these two men have been played on clay. 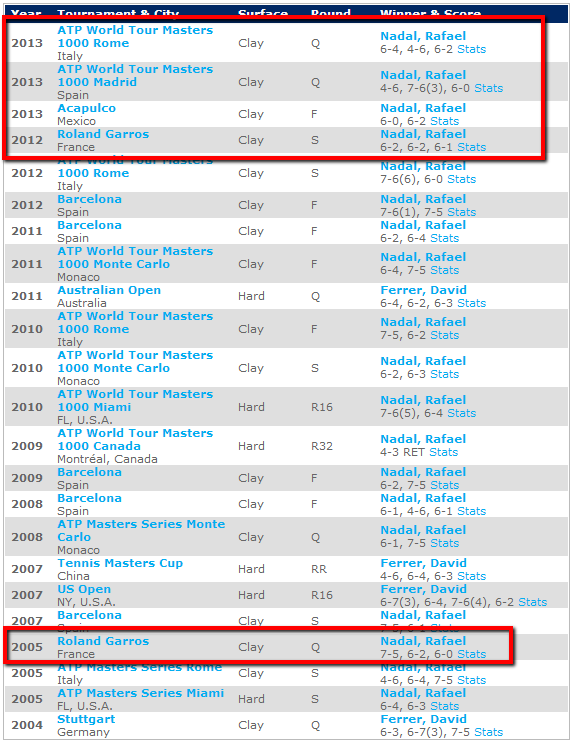 Nadal lost the very first one, way back in 2004 (which doubled as their first ever match against each other on tour). Since then, he’s won 16 straight contests against Ferrer on the red stuff. On a related note, clay is the best (and favorite) surface for both of these gentlemen. Nadal and Ferrer have played three times this year: the first was a much-anticipated final at the Acapulco ATP 500 (I did a LiveAnalysis post for that match, which can be found here). The reason for the hype was simple: at the time, it was Nadal’s biggest test after his long layoff. Ferrer was the highest ranked opponent that stood in Nadal’s way, after the 11-time Slam champ had gone through Viña del Mar (losing in the final) and Sao Paulo. And boy, was that a demolition. However, things have changed since then: Ferrer was an unfortunately-placed forehand away from having double-match point on Nadal in Madrid, and he pushed Nadal to three in Rome the following week, in a highly entertaining affair. 1. Who will be able to come up with the goods in the key points of the match? It’s been a custom of this narrative that while David Ferrer has pushed Nadal in several of their matches, he’s wilted frequently in crunch time. Nadal, on the other hand, is known for the opposite. He often comes up with his best shots at the most crucial of times. If these trends continue today, Ferrer will be in for a short appearance on one of the biggest stages of the sport. 2. How will David Ferrer handle adversity? Of course, the 31 year-old could come out smoking and never trail or face a difficult situation. But that’s the most unlikely scenario in a match of this magnitude, no matter the rival. There will be many times where Ferrer’s mettle will be tested, and none more than if he loses the first set. In their joint history, the winner of the opening stanza goes on to win the match 83% of the time. Ferrer has actually managed to get two wins over Nadal after dropping the first set… but both were in 2007, and both were on hard courts. 3. Who will be able to execute their gameplan better? When two rivals in any sport are very familiar with each other, their matches are not so much about tactical wrinkles or tricks: they’re about execution. This applies to these two Spaniards: they know every single thing they they want to do on a tennis court. Hence, it’s all about how well they execute their shots. Both men will try to find each other’s backhand. Both men will look to put pressure on each other’s serves. Both men will try to wreak havoc with their forehands. And both men know they’ll have to hit more than a few great shots to come up with the Coupe des Mousquetaires. 0-0: We start with a muscular point that Ferrer wins after forcing Nadal’s FH error with his own FH DTL. 15-0. An I-I FH then forces a Nadal BH DTL error. 30-0. SW up the T, 40-0. Ace up the T, and Ferrer starts the match in the best way possible. Wonderful start by Ferrer. Nadal seemed a little sluggish, but that’s not surprising. Even with a day in between, it’ll take a little bit for the all-time great to loosen up after Friday’s epic. 1-0, Ferrer: Nadal starts with an SW up the T. Followed by a SW out wide. 30-0. Then, Nadal opens up the court with a great CC BH, and finishes with a pretty BH dropper. 40-0. A great serve up the T by Nadal leaves him a short ball. He blasts an I-O FH…but misses wide. 40-15. Ferrer goes for a huge I-O FH return winner…and narrowly misses. Pretty even start to the match. 1-1: Ferrer gets a wonderful CC FH pass to Nadal’s feet, but the 7-time champ gets a gorgeous half-volley to drop perfectly. 0-15. A Nadal BH FE later, 15-all. Ferrer goes for a BH DTL, and misses it wide. 15-30. Another BH DTL UFE by Ferrer, and it’s 15-40. First BPs of the match for Nadal. Ferrer hits a great wide serve, gets a short return, but blasts his I-O FH well wide. Nadal has gotten the early break! Horrible service game by Ferrer, who seemed to get rattled by that great Nadal half-volley. Finished with 3 straight UFEs. 2-1, Nadal: Nadal goes up 30-0, but then loses 3 straight points, the last two on UFEs, to fall behind 30-40. First BP of the match for Ferrer. 2nd serve, and Ferrer sends the BH return long. Horrible, horrible mistake by Ferrer. A returner of his caliber just cannot afford to miss that return. But then, amends are made: a great return sets up a huge I-O Ferrer FH. He then hits a dropper afterwards, and executes a perfect BH DTL pass to set up BP #2. The point of the match ensues: a brutal rally that Nadal seems to be handling well ends with a BH UFE by the all-time great. David Ferrer breaks back! Nervy, nervy start to this match. Nadal still looks a little stiff, but great reaction by Ferrer to follow the disappointment of that bad service game, and then that bad miss on BP #1. 2-2: A BH UFE by Ferrer makes it 15-30. Danger for Ferrer once again. Like in Acapulco, he’s trying to go for way too many BHs DTL – and that’s probably his worst shot. Then…an unfortunate FH DTL mistake by Nadal, as he had a simple passing shot opportunity after a very poor Ferrer approach. 30-all…but that should’ve been 15-40. Great wide serve + FH DTL combo by Ferrer to force Nadal’s error, and it’s 40-30. A BH UFE by Nadal seals the hold for Ferrer. One wonders how much that missed FH DTL pass by Nadal at 15-30 will mean in the context of this set. Impossible to know at this time…but something to remember. You know what doesn’t help if you’re having trouble warming up and loosening up your body after a tough, tough match two days before? A cold, damp day. Which is not getting any warmer or sunnier any time soon. Speaking of the conditions, I’d like for Ferrer to limit the BHs DTL as much as he can. It’s not a good shot for him, and conditions are slow enough for him to run around his BH and hit I-I FHs as much as possible. 3-2, Ferrer: A SW makes it 40-0. An I-O FH UFE by Ferrer seals a much needed love hold for Nadal. 3-3: A predictable CC BH by Ferrer gives Nadal a easy look at a FH DTL winner, which he doesn’t waste. 15-30. Ferrer then comes to net and tries a BH drop volley…and sends it too long. Nadal punishes it later. and he has double BP at 15-40. BP #1 is saved by a forceful shot to Nadal’s FH that forces the error. 30-40. Rinse and repeat, and it’s Deuce #1. A FH DTL by Ferrer is called out…then corrected by the line-judge. Cedric Mourier comes to check the mark…and calls it out. Hawk-Eye calls it barely in. BP #3 by Nadal. Ferrer then makes a tactical mistake: he hits a great wide serve, but then chooses to come to net behind a BH DTL approach. Nadal has plenty of time to drill a CC BH pass…and he does. Rafael Nadal is up a break again! 4-3, Nadal: Trying to bounce back, Ferrer starts with a FH DTL winner. 0-15. It’s 15-30 after Ferrer forces a Nadal BH error with a CC FH. SW, 30-all. The pair play a fun, brutal point, that ends with a couple of Nadal haymakers. An I-O FH makes it 40-30. But Ferrer makes it Deuce #1 after a great wrong-footing CC BH winner. Nadal then gets a look at a lob after a soft dropper….but it lands just long. BP for Ferrer. And what a way to save it: Ferrer drills a return up the middle…and Nadal sends it back with interest. An I-O FH winner from the middle of the court. Deuce #2. 2nd serve. Nadal with a veteran move: he spots Ferrer “cheating” to hit a FH return, expecting a serve up the middle…and drives his 2nd serve wide. SW. An Ace up the T gives the Manacorí a key, key hold. 5-3, Nadal: In about 2 seconds, Nadal is up 0-30 in Ferrer’s service game. A thunderous I-O FH by Ferrer off a short return makes it 15-30. But a DF (first of the match for either man) gives Nadal 2 BPs/SPs. Nadal hits a gorgeous CC angled FH on the first one, and forces Ferrer’s BH error. Nadal breaks to take the set! Nadal was so poor for half of that set. Not a single game lost after he woke up. First Set to Rafael Nadal, 6-3. 0-0: A simple short FH by Nadal is driven into the net. 0-30. SW out wide, 15-30. BH UFE by Ferrer, 30-all. However, a great return by Ferrer sets up BP. Nadal pummels Ferrer’s BH with his FH, and finally forces the error. Deuce #1. CC FH UFE by Ferrer, and it’s GP for Nadal. Now a great BH DTL winner by Ferrer, after setting it up with 2 great FHs, and it’s Deuce #2. CC BH UFE by Ferrer after some good shots, and it’s GP for Nadal again. Ferrer lines up a short BH…but nets it. UFE, and Nadal gets a key hold. STATS UPDATE: Nadal, like in the semis against Djokovic, won the return of serve battle in the first set. By a wide margin, too. A terrible development for Ferrer. 1-0, Nadal: A gorgeous BH DTL winner by Nadal makes it 30-all. And a thundering FH DTL gives Nadal his first BP of the 2nd set. Rinse and repeat, and Rafael Nadal has gone up a break! Ferrer finds himself in the same situation Novak Djokovic was on Friday: down a set and a break to Rafael Nadal. Can he do what Djokovic did, and find away to take this set? It does not look likely….but I said the same about Djokovic’s chances. 2-0, Nadal: Light rain starts to fall, but Nadal is undeterred. His FH is not missing, and he’s going for huge shots with it. 40-0 in a flash. SW out wide, and it’s a simple consolidation hold for the 7-time Rolly G champ. 3-0, Nadal: The umbrellas are out on Chatrier, and the commentators say that the rain has gotten heavier. Are we heading to the first rain delay of the match? Who knows. Nadal narrowly misses a lob again, and it’s 15-all. Nadal smacks himself hard on the forehead after the miss. Something I don’t think I’ve seen him do before. Moments later, Nadal botches a CC BH and it’s 30-all. Ferrer forces Nadal’s error, and it’s 40-30. Great opportunity for Ferrer to stop the bleeding. But it’s Deuce #1 after Nadal puts away a short I-O FH. GP for Ferrer after another good BH DTL. Cat-and-mouse point at net, and Nadal comes away with it after a pretty drop volley. Deuce #2. A great I-I FH by Nadal, and he has a chance for a double-break. Which goes begging…after Nadal misses a FH DTL that looked like a foregone conclusion. Deuce #3. But it’s BP again after Nadal forces Ferrer’s BH error. It’s saved by some great shots from David. Deuce #4. GP for the man from Javea after Nadal misses a volley. More great stuff by Ferrer, who bosses Nadal from side to side with his FH, and finally forces the BH error. Nadal slips a bit, Ferrer attacks, and it’s double BP for Ferrer. That was a crucial hold for Ferrer. Much better to be down 1-3 than 0-4, no? I wonder how easily Nadal will put the memory of that missed FH DTL on BP behind him. The very worst position David can be on a court is when he takes a BH on the stretch leaving the FH DTL open. So deterministic. 3-1, Nadal: Ferrer comes up with 2 great shots, and he’s up 0-30. Nadal comes to net after a very short Ferrer return, and it’s 15-30 after Ferrer can’t get his pass over the net. Nadal slips and slides, Ferrer goes on the offensive, and suddenly it’s double BP for Ferrer. But both are saved by huge Nadal FHs. A third immense FH makes it GP for Nadal. Amazing string of shots from 15-40 down. It’s Deuce #2 after Ferrer forces Nadal’s BH error with an I-I FH. A FH UFE by Nadal gives Ferrer another BP. However, Ferrer sends a FH UFE long, so it’s Deuce #3. Ferrer blasts an FH DTL return winner off a weak 2nd serve, and he has yet another BP. The point of the match ensues…and it’s a repeat of the 15-30 point in Madrid, when Ferrer misplaced a short shot and gave Nadal a chance to hit his favorite passing shot: a CC BH winner. Deuce #4. SW for Nadal, and GP again for him, which he converts with a fantastic BH DTL winner. The last two games seem to be obviously important. 4-1, Nadal: At 15-30, a chant breaks up at the top of one of the stands. Seems to be completely unrelated to the match – a protest of some sort. Sigh. The crowd is booing, but Ferrer has had to wait over a minute to serve this very key point. Nadal then plays a vintage string of shots, and ends up forcing Ferrer’s error. 15-40, and more chances to go up a double-break. Ferrer saves the first one with some great FHs – an I-O FH forces Nadal’s FH error. An I-O FH winner saves the 30-40 BP. Deuce #1. A bad FH UFE by Ferrer, and it’s BP for Nadal again. SW, and it’s Deuce #2. A BH UFE by Ferrer gives Nadal yet another BP. 2nd serve…and a deep return coupled with a glorious I-O FH winner give Nadal the double-break lead, and will serve for the second set! Now something is on fire in the tunnel leading to the locker rooms. There’s actual fire. The protests against something keep going on. This is getting more and more ridiculous by the moment. 5-1, Nadal: Nadal comes up with a fantastic I-O FH, and it’s 15-all. A FH shank makes it 15-30. A DF gives Ferrer 2 BPs. And a classy point by Ferrer, in which he blasted a FH DTL approach and finished with a simple volley gets one of the breaks back. Some clown without a shirt, wearing a phantom of the opera mask and wielding a flare came on court in the previous break between games. That’s what caused the fire. You cannot make this stuff up. And a charging lunatic would surely disrupt anyone’s concentration, no? 5-2, Nadal: 2 straight DFs make it 0-40, and a wild I-O FH UFE gives Nadal the set. I recognize that this final was not the most compelling, but these incidents have completely destroyed the focus/play of both. Sad. Second Set to Rafael Nadal, 6-2. 0-0: Nadal starts us off with a quick love hold. Somebody saw that guy before he got near the court. If you see something, say something. 1-0, Nadal: It’s 15-30 after Nadal forces a BH error from Ferrer. Now an I-O FH UFE, and it’s 15-40. Only one BP is needed, as Nadal hits a wonderful CC return, and ends up with a simple volley to go up a break! 2-0, Nadal: A Nadal DF makes it 0-30. A fantastic FH DTL by Ferrer forces the error, and it’s 0-40. Also, it’s raining harder now. The umbrellas pop up everywhere. A glorious DTL FH half-volley from the baseline goes for a clean winner, and saves the first BP. Incredible shot by Nadal. But Ferrer gets the break after a fantastic CC return forces Nadal’s error. The tournament referee came on court, and it was clear that Ferrer wanted the match to be stopped. Had his jacket on, and everything. No dice. Nadal had jumped out on court well before that. 2-1, Nadal: David Ferrer holds at love after a SW out wide. 2-2: Nadal hits 3 great serves in a row, the last one an Ace out wide, and he holds to 15. 3-2, Nadal: Ferrer finds himself down 0-30, then complains about noise coming from the stands behind him, but promptly digs himself out and levels the game at 30-all. Nadal botches a FH DTL, and it’s 40-30. SW, and Ferrer has held. Every external element that could’ve gone wrong to disrupt this match has gone wrong. A pity, really. 3-3, Nadal: A thundering FH DTL by Nadal to make it 30-all is followed by a BH UFE. Ferrer has a BP. But Ferrer returns the favor with a BH UFE of his own. Deuce #1. SW, and it’s GP. A FH UFE by Ferrer seals the hold for Nadal. 4-3, Nadal: A sizzling FH DTL by Nadal makes it 0-15. But a great I-I FH by Ferrer forces Nadal’s error, and it’s 15-all. Now a short slice by Nadal is dutifully punished by Ferrer. 30-15. But then a simply glorious pair of I-O FHs by Nadal make it 30-all. FH UFE by Ferrer, and Nadal has a chance to break. It’s saved in style by Ferrer, with a simply unreal I-O FH that catches the tape. However, that’s followed by a Ferrer UFE. BP again. And now…a DF. Rafael Nadal will serve for his 8th French Open! 5-3, Nadal: 2nd serve, which is punished by Ferrer, who ends up forcing Nadal’s error with a good BH DTL. A BH UFE by Ferrer makes it 15-all. A good return by Ferrer is sadly followed by a BH DTL UFE. 30-15. Nadal 2 points away. An angled BH return goes just wide for ferrer, and it’s double-championship point for Nadal. And it ends in style: Ferrer hits a good CC return, and Rafael Nadal, the greatest clay court player of all time, blasts a crazy I-O FH winner. 8 French Opens. Nobody had ever won 8 times at any major. Now someone has. And it’s fitting that it’s Rafael Nadal at Roland Garros. Routine match, but extraordinary achievement. Congrats @RafaelNadal for Número Ocho. 7months away makes it sweeter for him, no? Game, Set, and Match to Rafael Nadal: 6-3, 6-2, 6-3. – Nadal is the first man in history to win a Grand Slam in nine consecutive years. NINE. – Nadal is also the first man in history to win a major 8 times. – Nadal never lost before the final: he entered 9 events, and he was in the title match on all nine Sundays. – Nadal picked up 7 titles: 1 Grand Slam, 3 Masters 1000, 2 ATP 500s and an ATP 250. As a comparison, World No. 1 Novak Djokovic has so far won 1 Grand Slam, 1 Masters 1000, and 1 ATP 500. – Even though Nadal will drop a slot in the ATP rankings on Monday, he’ll have a significant lead over everyone else in the ATP Race. This is no small detail, since half the season is already in the books for the men (2 of 4 Grand Slams, 5 of 9 Masters 1000, and 5 of 11 ATP 500s have already been played). – For the rest of 2013, Rafael Nadal only has 45 points to defend. Forty five. As a comparison, Novak Djokovic will have no chance to defend 270 points just from the Olympics: besides that, the Serb will have 6530 points to defend until the year is over. But back to the final: to state the obvious, the conditions did not help out the players. It was cold, it was damp, and large parts of it were played with rain falling down on Chatrier (roof, anybody?). Miraculously, there weren’t any rain delays, though we did come close in the third set. What was plainly evident is that even though this type of environment doesn’t suit Rafael Nadal’s game…it doesn’t suit David Ferrer either. The 31-year old would’ve much rather play in warmer conditions, which would give his shots the extra pop he needed to try to wear Nadal down. As it was, his younger compatriot was afforded more time to defend, and crucially, more time to set up counter-punching shots. When conditions are slow (either by the weather or by the surface), those players who can hit through the court will always have an edge. And in this particular rivalry, the difference in pace of shot has always been in Rafael Nadal’s favor. The now 8-time French Open champ didn’t have to rise to the heights reached in the fifth set of his semifinal win over Novak Djokovic, but was solid enough, and timely enough to put his forehand to great use. Also like in the semifinal, Nadal punished every single short ball that came to his AD-court with that all-time great forehand down the line. It’s such a deadly shot, because Nadal steps in to take it earlier than most of his other shots, giving his opponent less time to run all the way to the other side of the court. – Even though only two more points were played on David Ferrer’s service games than on his own, Nadal won 54% of all those return points (46 out of 85), whereas Ferrer only managed to win 38% (33 out of 87). – Most of the damage came on 2nd serve returns: Nadal ended up winning 24 out of 32 points (75%) played on that Ferrer delivery. That’s a higher percentage than what Nadal accomplished with his own 1st serve (70%). David Ferrer would’ve loved to play better, and he admitted that he just wasn’t able to. He ended up with 10 more UFEs than Nadal, 3 more DFs, and 13 fewer winners. He fought as hard as he could, through the rain, through the crowd demonstrations, and through the crazed streaker that took the court with a flare. Few things went Ferrer’s way in his first Slam final, which is unfortunate (I mean, how many major finals do you recall having a political demonstration during a game, and then a streaker with a flare?). Hopefully he can make it to this stage again so he can leave with a better taste in his mouth. Back to Rafael Nadal: in 2013 he added another large wing to his Clay GOAT palace. He now owns 8 French Opens, 8 Monte Carlos, 7 Romes and 8 Barcelonas. Those are the most historic tournaments played on this surface, and Rafael’s excellence in them is simply unparalleled. At this point, it’s more likely that we get invaded by aliens than someone putting together a better clay resumé on this planet. More than that, Nadal added to his overall legacy: he’s now tied for third for most Grand Slam titles ever at 12. And he’s in great position to add another Year-End #1 to the two he already secured in the past. It’d be silly to bet against him at Wimbledon, since grass is his second best surface (let’s remember that he’s won it twice and made the final 5 times). None of this is surprising to me, particularly if you read #10 here. But I will admit that I didn’t think what happened after Viña del Mar or Sao Paulo was possible. Heck, I didn’t even think today would happen after the Monte Carlo final. But that’s Rafael Nadal for you: just when you think he’s done, just when you think he won’t climb to the top once again…that’s when he’ll do it. I can’t wait to see what he does at Wimbledon. Thanks for the detailed preview, JJ. Do you think Ferrer will be able to at least take one set from Nadal? Nadal is better than ever, no one should ever bring the knee issue again this season. Somebody may also call him out on the “I’m not the favourite” thing. Fine. Nadal’s knee should never be mentioned so long as Federer’s back is never brought up, or Djokovic’s ankle or hamstring or calf or back or whatever body part he clutches in his next match. Rafa has chronic knee tendinitis. It will never go away. It can be managed – hopefully well. Anybody with a chronic condition will tell you that it’s better some days and worse others. Tennis fans should just wish Rafa well and wish him good health as they do everyone else. Next Entry: Grass Season is Here!